Ascent IT Ltd trades as HUE and sells the incredible award winning HUE Animation Studio sets. The kit contains everything that a potential animator needs to learn in order to make stop motion videos. The software is fully compatible with Microsoft Windows or Apple Mac OS X and has a fast set-up process. 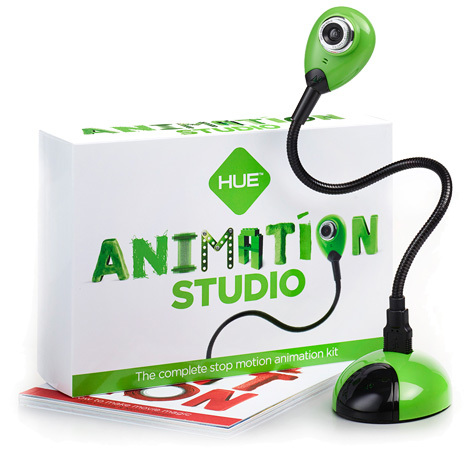 Each pack contains a HUE HD Camera incorporating a microphone, a USB cable, Animation Software and a comprehensive 60 page book of instructions and tips. green Free software updates are available from the HUE website. Many schools have incorporated HUE Animation into their craft and IT lessons where they find that kids quickly learn how to use the Studio and create comical and serious stop animation scenes or video clips. Thanks to the flexible stem the camera can be mounted in almost any position to capture shots from any angle. Products are available to buy from the HUE website or Amazon in addition to third party sellers.